When I was last in Liberia (two long years ago now), I went to the market more or less every other day with my Aunty to buy soft shell crab to put in the okra stew. I was obsessed. With Liberia sitting north of the Atlantic Ocean you have all the daily caught fresh fish and seafood on your doorstep, and this had me in the element of dreams. My dream being that if I lived by the ocean I would eat fish and seafood all day, every day. By Liberian standards it is a luxurious meal to have every other day, as it would be if I was to have it back in London, but the baby crab was about a 10th of the price I would pay for it back in the UK – and we all know how we all become flush when on holiday. Ha! Growing up, Mama used to make okra stew with beef and sometimes king prawns, but after my trip to Liberia this has been my go-to indulgent meal to cook…usually just after payday and not every other day. Put a shallow large pan onto a low heat and add oil to the pan once warm. Add onions and jacato to the pan and cook down until the onions are translucent in colour and the jacato has turned a golden brown. Mix the vegetable stock and mixed herbs with 300ml of hot water and add both the stock and okra to the pan. Turn up to a medium heat and leave to cook for 10 minutes. After 10 minutes, the okra should still be vibrantly green but will have softened and should have soaked up all the liquid, now making the sauce slimey. 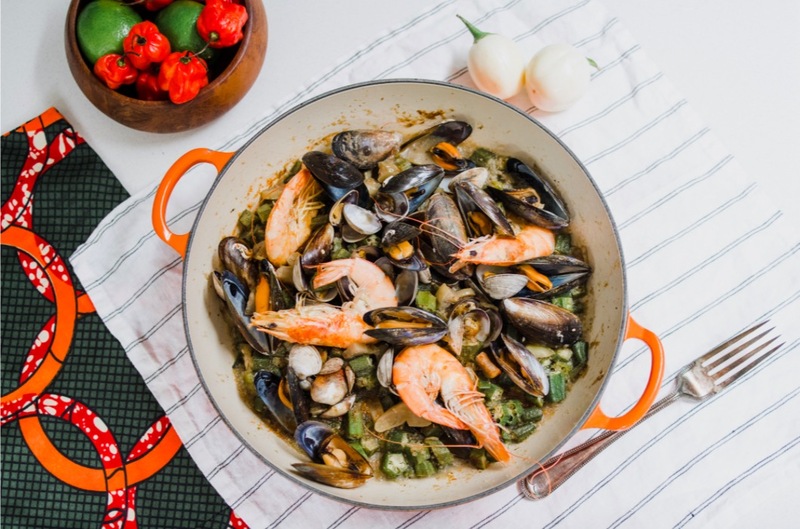 You now add the seafood, starting with the mussels and clams first. Add to the pan and cook with the lid on the pan for 5 minutes. After 5 minutes, add the tiger prawns and cook for a further 4 – 5 minutes, turning the prawns over so they cook on both sides. I’m new to okra, I’m growing some this year in my garden!! I’ve cooked it a few times now, and in a few days I’ll have picked enough to make your receipe – the timing couldn’t be better!! Thanks so much!